In a nod to the title of the famous novel, many rooms of the Hotel Eiffel Blomet have a terrace that offers a magnificent view over Paris. To make the most of this, you can have your breakfast there. Pastries, tartines and fresh fruit are even tastier enjoyed in the open air! Specify when you make your reservation that you want a room with a terrace. Want to take a break or enjoy the ideal end to your day? The Honesty Bar at the Hotel Eiffel Blomet invites you to enjoy an experience with a difference. Here, the bartender is you! You are welcome to compose your own cocktail, according to your desires of the moment, from a varied assortment of traditional French and foreign drinks. To savour an aperitif or following a lovely evening, make yourself comfortable in this appealing, intimate and convivial space. Viewed from above, Paris is even more magical. 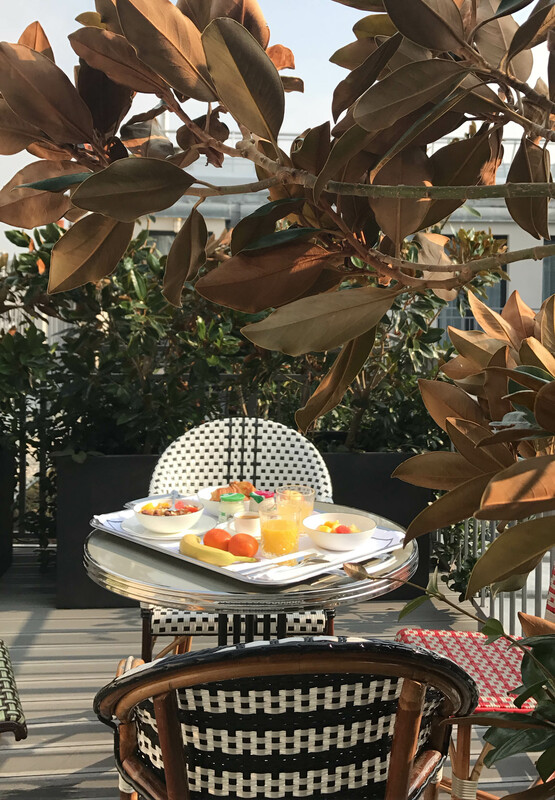 Give your Parisian stay an extra touch of charm by booking a room with a terrace at the Hotel Eiffel Blomet and then sip one of your own creations in the Honesty Bar!